This is a great harp mic my collection. Another dual-Z mic which benefits from 3 functions. HI-Z - The is the setting you require to get that muddy Chicago blues groove, high impedance, low down 'n' dirty! OFF - You can't beat an off switch to help control feedback or any unwanted background noise at certain times. What makes this mic really rock is it’s sheer durability and readiness to start gigging. The mic body is made of a heavy solid steel and will happily take a knock or two on stage, comes with detachable 5m, yes 5m quality lead with it’s own mic clip, all in a tidy little case. Ready to go, no messin’. 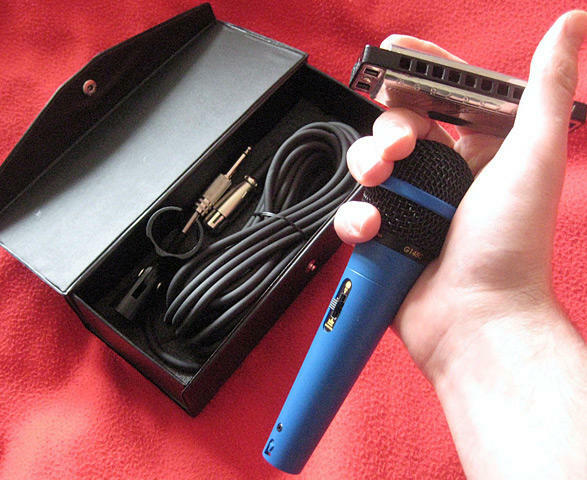 A truly great mid priced blues harmonica microphone that will still be telling the stories in many years to come. Finished in a wonderful blue colour. Well, what else would it be!